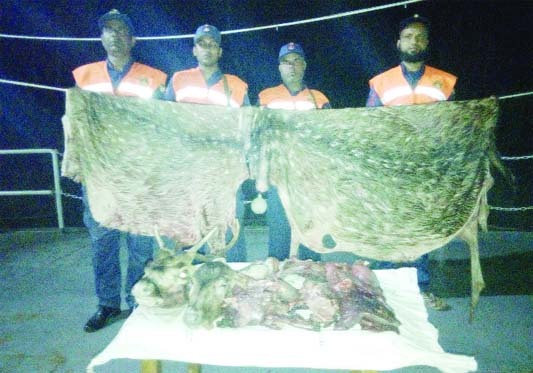 BAGERHAT: Members of Coast Guard recovered seven kgs of meat, two heads and two skins of deer at Harbariya Canal on Sunday. The City Corporation and District Administration along with different political, socio- cultural organisations and educational institutions chalked out elaborate programmes to celebrate the Independence and National Day here today with much enthusiasm and patriotic zeal. The day's programmes will begin with heralding of 31 gun salutes at Police Line and placing floral wreaths at the altar of the city's Shaheed Miner with sun rising. The programmes also include hoisting of national flag atop all government, semi-government, private and public buildings, institutions, reception to the Freedom Fighters (FFs) and screening of documentary films at different cinema halls and other open places. A combined march-past of the police, Ansar-VDP, fire service, BNCC, scouts, girl guides, jail guards and students of different educational institutions will be held at district stadium in the morning. Divisional Commissioner will hoist the national flag and witness the spectacular march-past and physical display. At noon, the valiant freedom fighters will be accorded reception at Shilpakala Academy conference hall. Sports and discussion will be organised for the women on Riverview Collectorate School ground in the afternoon. Art competitions, rendering patriotic songs and poetry recitation will also be held for the school and college students on the occasion. BSS from Khulna reports: Khulna district administration, political parties and socio-cultural organizations are set to observe the 49th Independence Day today (Tuesday). To mark the day, Khulna district administration has taken elaborate programmes. A 31-gun salute at dawn at the Khulna Police Line Ground will herald the Independence Day. Khulna Divisional Commissioner Lokman Hossain Mia will hoist the national flag at Khulna Zila School Ground and will take salute from the parade. Khulna Shishu Academy will organize an art and painting competitions for children on the occasion. A discussion meeting and a reception to the freedom fighters will be held at the conference room of the DC office. National flags will be hoisted atop all public and private buildings at dawn and wreaths would be placed by the people of all walks of life at the Gallyamary monument on the day. Special prayers will be offered at mosques, temples and churches, seeking divine blessings for peace and progress of the country. 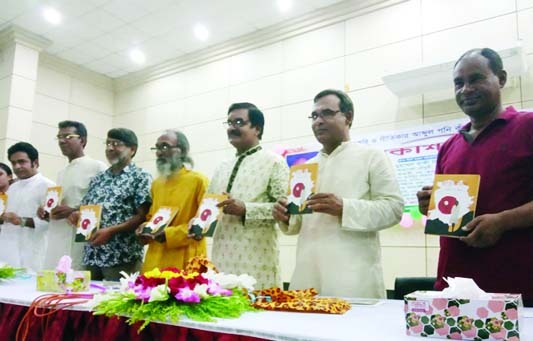 State-run Khulna Betar will broadcast special programmes while the local newspapers will bring out special supplements on the occasion. Khulna BISIC will organize a two-day handicraft fair on Khulna Public Hall premises. Besides, Khulna city and district units of Awami League have been chalked out different programme to observe the Independence Day. The programmes include hoisting of national and party flags and to place wreath at the portrait of the Father of the Nation Bangabandhu Sheikh Muzibur Rahman and at the Gallamary martyrdom memorial. 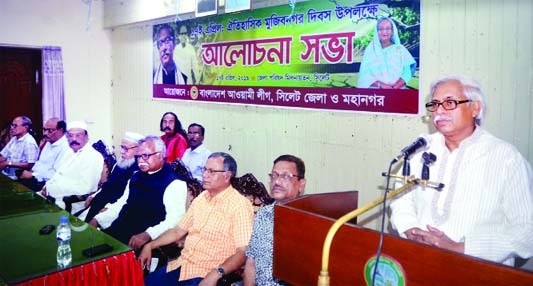 A discussion meeting will be held on March 26 at the party office, said a press release issued by city unit AL office secretary Mahbub Alam Sohag on Saturday night. A colourful independence procession will be brought out in the city on March Khulna University (KU), Khulna University of Engineering and Technology (KUET), Khulna City Corporation (KCC), Khulna WASA, Khulna Press Club, Khulna Union of Journalists (KUJ), 1971: Genocide and Tortured Archive Museum and different socio-cultural and political parties will observe the Independence Day in a befitting manner. BSS from Rangpur adds: The jubilant people of Rangpur are ready to celebrate the great Independence and National Day-2019 through colourful programmes amid huge enthusiasm and festivity today (Tuesday ). Deputy Commissioner Enamul Habib said the official celebration of the Daywill begin with heralding 31 gun salutes at Police Lines ground followed by placing of wreaths at 'Swadhinota Smritistambha Arjan' in the city at 6 am. Swadhinota Smritistambha `Arjan' and Monument of Martyred Freedom Fighters in the city after sunrise. The divisional and district level government officials, leaders of AL and its associate bodies, Bangladesh Muktijoddha Sangshad, BNP, Jatiya Party, BNP, JASOD, Gano Forum, Ganatantry Party, Communist Party of Bangladesh, Bangladesher Samajtantrik Dal, Workers Party and other organisations will place wreaths at those places. government, semi-government, private and public buildings, educational institutions and other establishments with the sunrise. The main streets and roadside islands will be decorated with the national flag, colourful posters and miniatures and the government and semi-government and private buildings be illuminated in the divisional city. Divisional Commissioner Mohammad Joynul Bari will hoist the national flag amid rendering of the National Anthem at Rangpur Stadium at 8 am. He will also take salute of the March Pasts there with participation of Freedom Fighters, metropolitan police, Ansar-VDP, BNCC, fire service and civil defense personnel, jail guards, scouts, rover scouts, girls guide,students and children. Shooting, drawing competitions for children on the War of Liberation, charity football match, screening of documentary films of the War of Liberation, spontaneous blood donation, cultural functions and prize distribution functions will be organised. The freedom fighters, family members of martyred freedom fighters and their relatives will be accorded receptions, discussion on the War of Liberation and independence and sports competitions, with participation of women be arranged in the afternoon. Special prayers will be offered at all mosques, temples, pagodas and churches and improved diets be served to the inmates of all hospitals, Shishu Paribars, shelter homes for older citizens, orphanages, jail, vagabond centers and child homes. Rangpur Kendra of Bangladesh Betar will air special programmes and local dailies, weeklies, monthlies and online newspapers will publish special supplements glorifying importance and dignity of the great day. The district administration will arrange the main discussion to be followed by prize distribution ceremony on the Central Shaheed Minar premises in the city at night on the day.